From 1907 to 1982, the former hospital on County Farm Road housed hundreds of patients on six floors, including boys, girls, men and women. Admission was not discriminatory. Some were paying patients, while others were guests of the state or county. Regardless of who paid the bill, admission in the beginning was $7 a week, according to hospital records. The facility changed names and purposes over the years. It was originally built as the Michigan State Sanatorium at Howell for the treatment of tuberculosis. It later became Howell State Hospital when patients with developmental disabilities where treated there. It was renamed the Hillcrest Regional Center for Developmental Disabilities before it was closed. In Polk's Michigan State Gazetteer and Business Directory for 1921, it is listed as the "State Sanitarium for Tuberculosis." The Michigan State Gazette for February, 1907 notes that the "State Sanitorium for Consumptives, located three and one half miles from Howell, has been connected up by the Livingston County Mutual Telephone Company...."
The sanatorium - "The San" as many former employees affectionately call it - was more than just a place were people came for treatment. It was a self-sufficient entity that aimed to meet the patients' and employees' every need with a working farm, apple orchard, convenience store, post office, water and heating plants and kitchen staff. The hospital, situated on the highest point in southeast Michigan, according to former employees and paperwork detailing the beginning years of the state's first tuberculosis sanatorium, offered patients a picturesque place to live. Dormitories also were set up for single employees, while married staffers were offered apartments - four per building. Physician apartments were close to the hospital "in case of emergencies," explains Detterbeck, a native of Switzerland. Since each of the physicians hired at the sanatorium were specialists in tuberculosis, it was common to have several countries represented. During Detterbeck's 25-year tenure, the countries of Thailand, Germany, Turkey and the United States were all represented at one time. After leaving the facility, many of them stayed in the area, opened practices, shared services and even helped some former patients become doctors. The hospital was located on what is now High Hillcrest Drive, at approximately what is now 3125 High Hillcrest Drive. The lat-lon is 42.5872558, -83.9785627. 1890 - The Michigan State Board of Health begins to petition the state Legislature for money to create and support a Michigan State Sanatorium to care for patients suffering from tuberculosis. 1905 - State legislators approve $20,000 for land acquisition and one year of operating expenses. 1906 - Howell area site selected from more than 20 potential sites. The land was 1,100 feet above sea level, making it the highest point of the natural watershed in the Lower Peninsula. 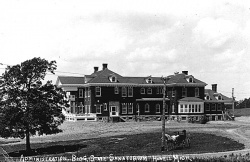 1907 - The sanatorium opens Sept. 7 with the admittance of two patients. 1909-1930 - Construction continues as the hospital grows from a 16-bed facility to a 500-bed hospital, with children's cottages, employees' quarters, a laundry and more. The Michigan State Sanatorium became known as one of the most modern and up-to-date sanatoriums, drawing patients from all over the United States. 1952-1954 - New antibiotic drugs were coming to the market, resulting in a 70 percent drop in tuberculosis-related deaths at the local facility. 1958-1960 - The sanatorium begins to accept developmentally disabled patients. 1961 - The hospital was transferred to the Department of Mental Health and becomes known as Howell State Hospital. 1978 - The facility is renamed Hillcrest Regional Center for the Developmentally Disabled. 1982 - Hillcrest closes because the state cannot afford to maintain the facility. 1985 - Buildings on the former Hillcrest Regional Center property are demolished following years of disuse. 1987 - Developers buy the property with the intent of building luxury homes. This page was last edited on 29 April 2015, at 08:13.